Last month I reported that the number of properties sold this year are holding steady compared to 2016. Non lakefront properties are the only categories that have seen increases with sales of off water homes up 8.8% and off water lots up 39.3%. Average days on the market and sales prices continue their upward trend in most cases. 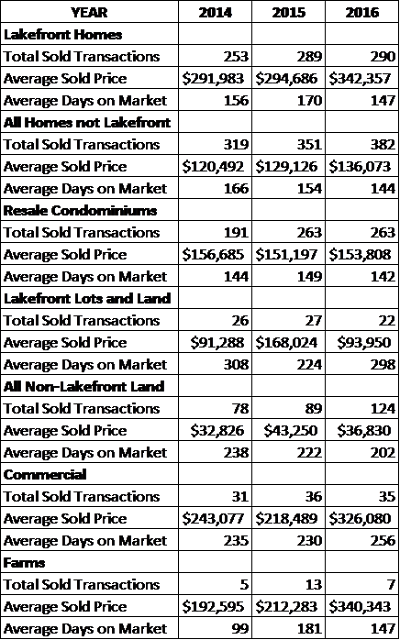 Below is a breakdown comparison of sale for the past 3 years. 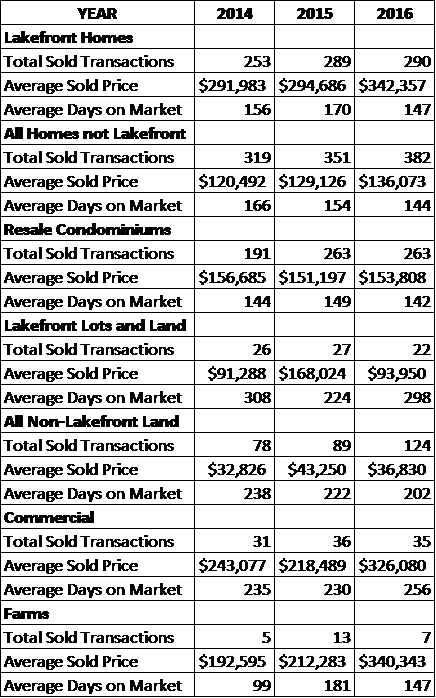 Sales data obtained from the Lake of the Ozarks Board of Realtors data from January 1 to June of 2014, 2015 and 2016. Nationally, pending home sales rose for the third consecutive month in April and reached their highest level in over a decade. All major regions saw gains in contract activity last month except for the Midwest, which saw a meager decline. The Pending Home Sales Index, a forward-looking indicator based on contract signings, hiked up 5.1 percent in April above March and is now 4.6 percent above April 2015. After last month's gain, the index has now increased year-over-year for 20 consecutive months. Following the housing market's best first quarter of existing-sales since 2007 and a decent increase in April, NAR expects sales this year to climb above earlier estimates and be around 5.41 million, a 3.0 percent boost from 2015. After accelerating to 6.8 percent a year ago, national median existing-home price growth is forecast to slightly moderate to between 4 and 5 percent. The number of sales at Lake of the Ozarks is holding pretty steady compared to 2015 but we are seeing a continual increase in the average sale prices. Based on the influx of activity I’ve seen the past 3-4 weeks, I feel the number of sales will gain more ground in 2016 over the next 90 days. The number of Lakefront Homes sold only increased slightly so far in 2016 with 8 more homes sold than 2015 however the average sales price has increased 14% in 2016. The average lakefront home sales price in 2016 is $338,337. Offshore homes sales had a slight increase of just over ½ percent from 2015 and the average sales price increased by 5.2%. The average sales price of offshore homes is $138,313. The number of condominium units sold decreased by 10 sales this year but also saw an increase in the average sales price of 4.6%. The average condo sales price in 2016 is $160,167. Sales data obtained from The National Association of Realtors®, and the Lake of the Ozarks Board of Realtors data from January 1 to May 29 of 2015 and 2016.